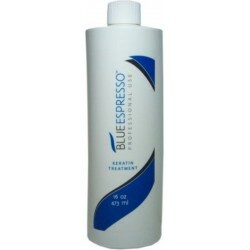 Blue Expresso Keratin Smoothing Treatment 16 oz. - Just Beauty Products, Inc.
> Hair Products>All Keratins>Blue Hair Keratin>Blue Expresso Keratin Smoothing Treatment 16 oz. Blue Espresso reinstates nutrients lost in hair, regenerating hair rapidly and effectively. In just few minutes hair will have a healthy and radiant look. Coffee is the main ingredient found in Blue Espresso along with vitamins and minerals protecting and nourishing capillary fibers.reinstates, regenerates and straightens hair providing volume reduction, eliminating the frizz and restoring the capillar fibres. If using Blue Hair Conditioner and Shampoo Color Care as maintenance your keratin Smoothing treatment will last for Up to 4 months. 1. Wash hair carefully using Clarifying Shampoo designed to open hair cuticles. Repeat procedure. 2. Separate hair in locks. 3. Apply Blue Espresso in small locks using an application brush for hair dye. 4. After applying in all hair proceed to dry with a thermal brush or using hair dryer and a proper brush as if drying hair. 5. Then proceed to straighten hair using a hair iron. The iron should be applied to small locks of hair. Temperature of hair iron should reach 450ºF, repeat 5 to 7 times. 6. Wash hair using Shampoo Color Care System to remove product. Warning: This product contains ingredients which may cause skin irritation on certan individual and a preliminary test accordingly to the normal procedures should first be made. The Person applying this product should wear gloves and mask is recommended. Apply only in a well ventilated area. Avoid contact with eyes. If the product enter in contact with the eyes wash it with plenty of water. Ingredients: Water, Cetyl Alcohol, Cyclopentasiloxane, Amodimethicone (and) Cetrimonium Chloride (and) Trideceth-10, Steartrimonium Chloride, Mineral Oil, Clycerin, Hydroxyethyl Cellulose, Fragrance, Hydrolyzed Keratin, Collagen, Silk Amino Acids, Hydrolyzed Wheat Protein, Hydrolyzed Rice Protein, Hydrolyzed Soy Protein, Hydrolyzed Silk Protein, Formalin, Coffea Arabica (Coffe) Seed Extract, Stearamidopropyl Dimethilamine, EDTA.